Hi there! Time to get back into action. It is a cold, windy day in the sunny South. After having a very mild, Spring-like February, Winter roared back with a vengeance, dropping the overnight lows into the 20's and even dropping snow in some areas over the past weekend. This seems like the perfect time to pull out some long neglected cold weather comfort food. While I'm not a great fan of grits, hubby and I both like shrimp and grits. He has tried them in just about every restaurant that has them on the menu, so I decided I should make some myself. After all what's hard about making grits? The only required ingredients are, of course, the shrimp (any size is fine) and grits, again any style you like will work. Next you decide on your liquid. 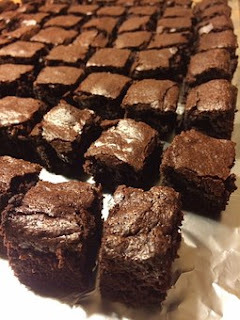 There are as many different recipes as there are folks making them. You can use just plain water, or chicken, vegetable or shrimp stock, which can be combined with anything from skim milk to heavy cream, but the use of dairy is not required. Next comes your choice of cheese such as cheddar, parmigiano reggiano, gruyere or whatever you enjoy. If you don't like cheese, don't add it. 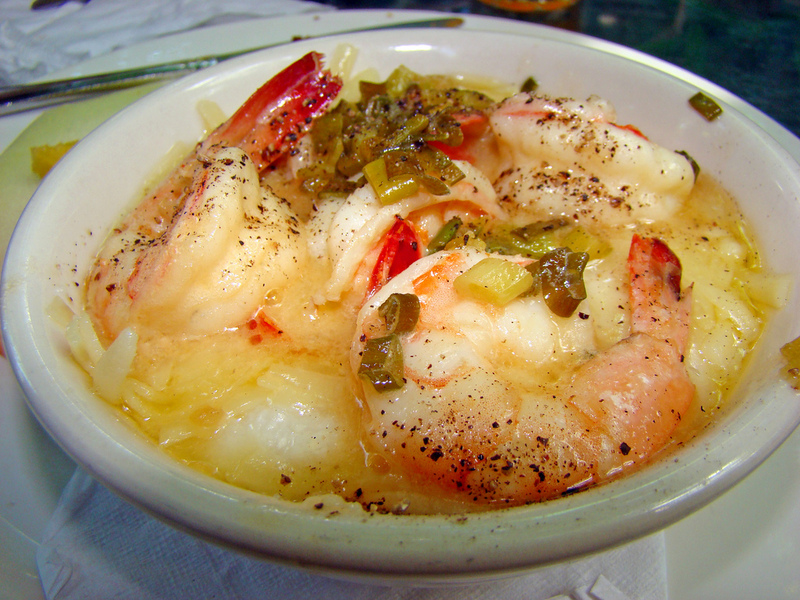 In addition to the shrimp, there is often another protein such as Tasso or spicy sausage. 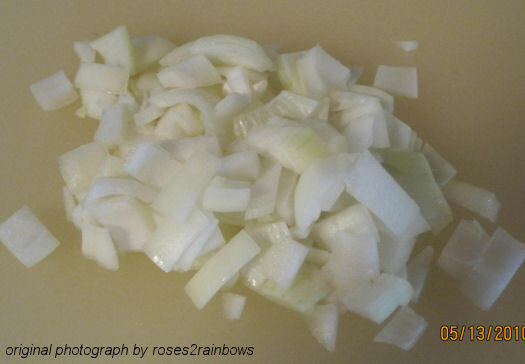 The remaining add-ins/add-ons may include garlic, onions, parsley and green onions. Now we get down to how I made shrimp and grits for two. Bring the water and milk to a boil and add the grits and salt, then reduce the heat, stirring frequently. While the grits are cooking, add the olive oil to a skillet and brown the sausage, then add the onions, letting them soften before adding the garlic. After about 5 minutes, add the shrimp and Cajun seasoning and cook for about 5 minutes, more or less depending on the size of your shrimp. Add the 1/4 cup of water to deglaze the pan, then add the butter, cover and keep warm. When the grits are cooked to the texture and/or consistency you desire, it's time to stir in the cheese. 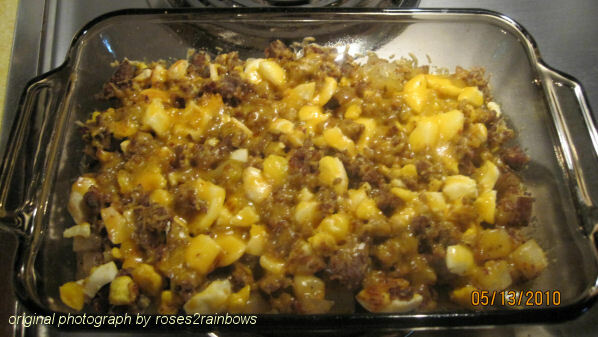 Serve in a bowl or soup plate and spoon the shrimp and sausage mixture on top. Serves two. Total prep and cooking time about 1 hour and 20 minutes. As I mentioned, this is not a quick-fix meal. The grits alone took well over 45 minutes to cook and even then they were not as thick as they are when I just use water. Also, use a heavy bottom pot because using milk seems to make them stick to the bottom. Perhaps it was a combination of my lightweight pot and my stove, but they required almost constant stirring. I also chose to cut my shrimp, but leaving them whole makes for a prettier presentation. I congratulate my sou chef for helping bring the meal together. We both agreed that we will be doing this again, with a few adjustments. I may change up the liquids and ratios, and use wine instead of water to deglaze the pan. Sadly, I have no picture of our tasty creation because after the extended wait for dinner, we plated and ate, so I borrowed an image found online. Written for the 30-day creative writing challenge hosted by Nicky and Mike of We Work For Cheese. Today's prompt is The Awkwardness of the common banana. This is day 17 of this never-endng challenge. Check out the Linky at WWFC for some delightfully fruitful stories. What would you think about a banana stuffed into a pineapple ring, smeared with mayo and topped with a cherry? Let's just say it was not all that appealing, and left us feeling rather awkward. The setting was Christmas back some 20 or so years ago. We were visiting my in-laws over the holidays, and my mother-in-law, bless her heart, decided to make a special treat for us. She found the recipe in a magazine or old cookbook (we didn't have the internet then) and proceeded to assemble her creation. When she brought them out, we stared in disbelief at the somewhat suggestive looking item being placed before us. Being the tactful people that we were, we tried to hide our...uh...amusement. As you can see it's a rather risque looking dish. We were holding back our laughter pretty well while we tried to figure out how to tell her just what it looked like. That is until my brother-in-law exclaimed "that's a nasty chancre on that thing". At that point we all burst out laughing, and had to explain what was so funny. Interestingly, the banana candle recipe was originally published in several 1950s cookbooks for children. More recently I saw this recipe and picture in a popular spice catalog. Apparently it was more common than we thought. 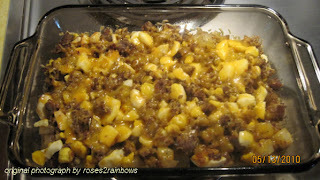 So tell me what you think - Yum or Yuck? Written for the 30-day creative writing challenge hosted by Nicky and Mike of We Work For Cheese. Today's prompt is In the Kitchen. This is the 12th mind-blowing day of this challenge. Check out the Linky at WWFC to see what everyone else is cooking up. A lot has happened in my kitchen. This has been my kitchen for over 25 years, and it is pretty much the same as it was the day we walked in for the first time. There's a new fridge, that is it was new in 1992, and a new dishwasher about 13 years ago. In our house new is a relative word. I learned to cook in this kitchen, something my Mom wanted to teach me years before, but I said "I'll learn when I need to" Foolish me. I did absorb more than either of us thought, which gave me a good background for learning. I've learned a lot in my kitchen, like how to handle a knife, and make a sauce that doesn't break. I've learned about herbs and spices and how to create my own dishes. The cats are fed in the kitchen so there's always cat food on the floor. 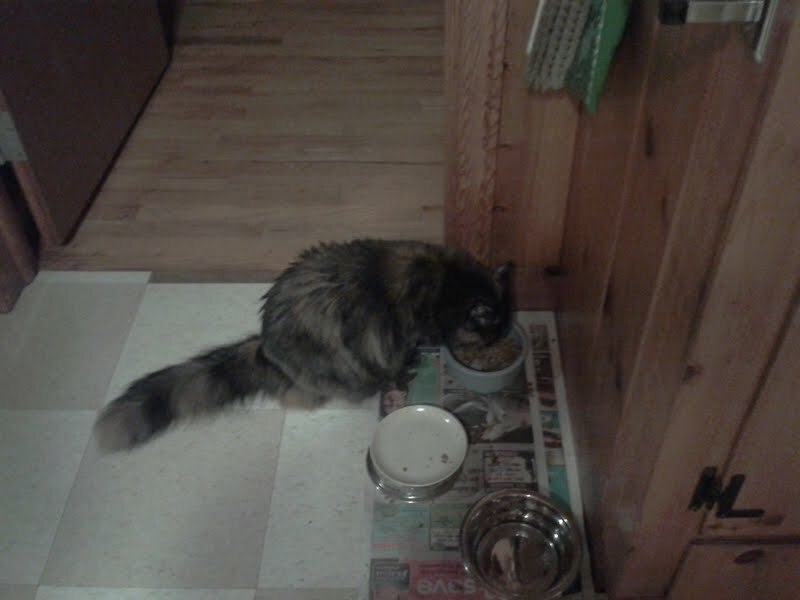 When our cat, Missy, was sick and wouldn't eat, I made cat food smoothies and hand fed her, seated on a chair with a towel pinned around her neck. She stoically accepted the food - until she had had enough. 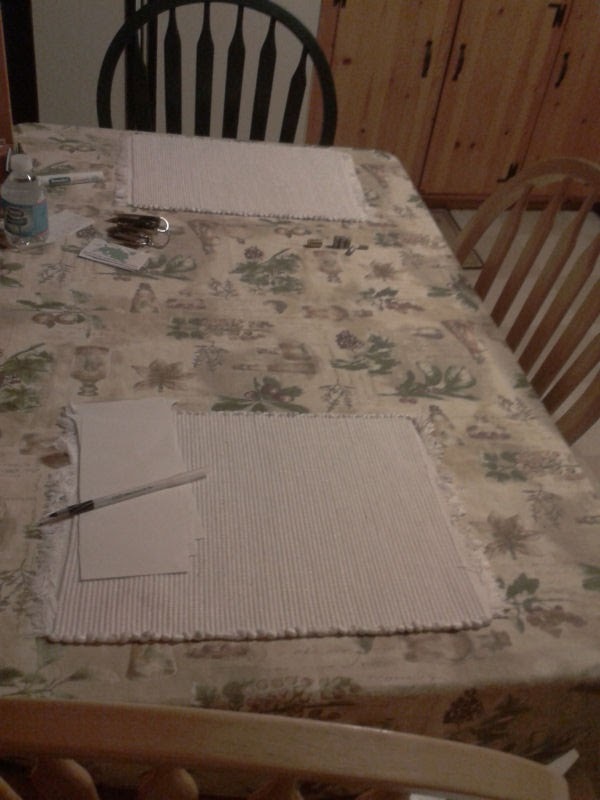 Games have been played and friends entertained at the kitchen table. Wine has been drunk and many conversations had that lasted long after the food was eaten and the plates had been cleared. There have been messes and spills, broken glasses, and many experiments. There have been cuts and burns and, yes, a few curses. 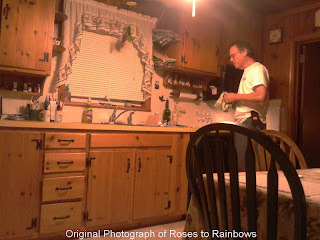 There has been laughter and tears over the years in my kitchen, which means there has been a lot of living in my kitchen. If your home is your castle, the kitchen is it's heartbeat. What's the story in your kitchen? A while back I gave you my tried and true method for boiled eggs, and it really does work - that is when you follow directions. Now if you plop the eggs into the pot and crank the burner up on high, you're following directions. But if you then go switch on the mind-numbing, I-can't-hear-a-thing vacuum cleaner and proceed to clean in the next room, well, I can't be responsible. Oh wait, that was me (hangs head in shame). When I had to shut the vacuum off to move to another room, as I'm limited by my 16-foot cord, I heard something that jogged me back to the present. There was rattling and a weird hissing sound coming from the kitchen. Water was bubbling over onto the burner, and the eggs were crying out that it wasn't enough to be boiled alive, but their little bodies were being badly beaten, too. I quickly turned off the heat, and figured since they'd had been at a hard boil for several minutes, they would be over cooked if I left them on the burner. So in my effort to salvage the eggs, I pulled them off and set my timer for the usual 15 minutes. This is what I got. Eggs - medium well. Unfortunately, they weren't suitable for my potato salad, but it wasn't the end for these eggs. No siree! I'd find a way to use them, and I came up with a plan. This was last night's dinner. I started with one large baking potato, scrubbed and diced. And about 1 cup of chopped onions. 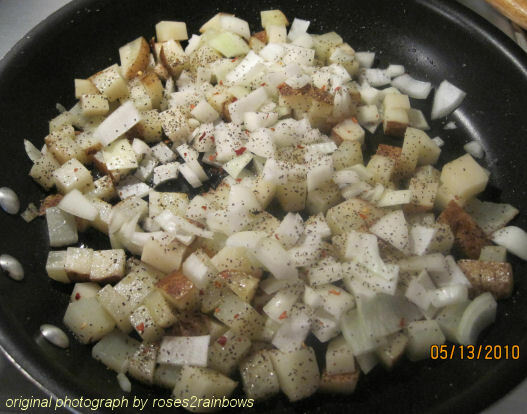 I cooked the potatoes and onions together over low to medium heat, and added salt and pepper. 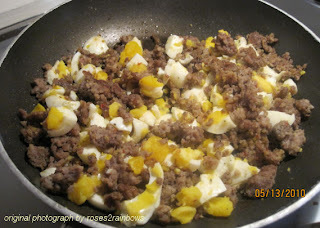 In another pan I cooked 1/2 pound of "hot" breakfast sausage, and when it was browned I added the eggs and chopped them into the sausage. I combined everything into one baking dish, topped with shredded cheddar, and warmed in the oven until the cheese melted. It was pretty tasty, especially considering what inspired the dish. Sometimes accidents are the mother of invention. With the picnic season just around the corner, and all the ways we use eggs (e.g. egg salad, potato salad and deviled eggs), I got to thinking about how many variations there must be for achieving the perfect hard boiled egg. I've read about people steaming them, and even pressure cooking them. I haven't tried either of these methods, and I'm not here to bring you everyone's tried and true approach to the perfect egg - just mine. 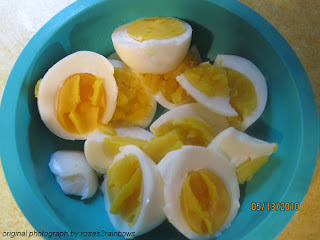 This is the way my mom taught me to make boiled eggs with a twist of my own. Place your eggs in a pan of cold water with the lid on, and turn the burner to high. Set your timer for 15 minutes, and watch closely. As soon as the water comes to a boil, turn the burner off and start the timer. When the eggs are done, drain and rinse with cold water. Run more cold water into the pan and let it set a couple minutes. Drain the water, replace the lid and shake vigorously, holding the lid on. The eggs will peel nicely and have a perfect yolk. So give this one a try and see for yourself that boiled eggs are as easy as 1-2-3. Do not add salt to the water. 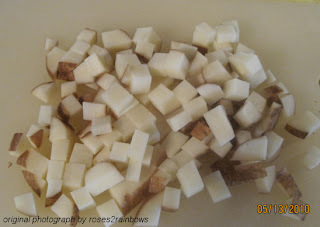 This raises the boiling point of water and may make the whites rubbery. Room temperature eggs are less likely to crack, and take approximately one minute less to cook than eggs right from the refrigerator. A TB of vinegar added to the water will prevent the white from running out of any egg that happens to crack. However, this can affect the taste. Overcooked eggs may produce a green ring around the outer surface of the yolks. The recipe is simple and consists of boiled eggs, mayonnaise and salt & pepper. Other add-ins include onions, pickles, celery, mustard, dill, and bell pepper.